reunion. Have fun and be safe. Maybe I'll make the 50th! Thomas Alm has a birthday today. 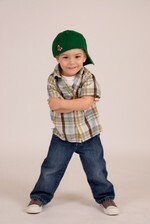 My grandson, Ben, hamming it up. Drilling Rig #3. Back in the Indianola days I never imagined I'd be a Kansas oilman. Grandson Ben & Tom having fun on the water. 55 Chevy I've been restoring. Turkeys on Hell Creek Ranch. If you're a turkey hunter, give me a call...I've got plenty!